The introduction of Grandia GD07 and GD08 cases from SilverStone ushers in a new era of home theater computing like never before. For the first time, the power and storage capacity of a server can now be neatly stowed beautifully and quietly in a home theater environment. Completely reengineered to fully utilize all available spaces, the Grandia GD07 can accommodate an incredible amount of drives (up to eleven) and high-end components (graphics cards up to 13.6 inches long) with minimal sacrifices. It is even possible to fit SSI EEB (12" x 13") extended ATX motherboards in the GD07 despite maintaining an exterior dimension similar to SilverStone's previous generation full-size HTPC cases.With a wealth of lessons learned from building the best performing tower cases in the last several years, SilverStone engineers upgraded GD07's cooling performance tremendously with up to four 120mm fan options. And to make sure owners can easily maintain their cases' cooling ability over time with the lowest noise possible, custom designed removable filters surround the case for positive pressure to work effectively and quietly.Built to hide the imperfection of I/O ports and the plethora of drives that may be installed in its four 5.25" drive bays, the GD07's lockable aluminum front door is beautifully finished with hairline brush pattern to match other home theater components. 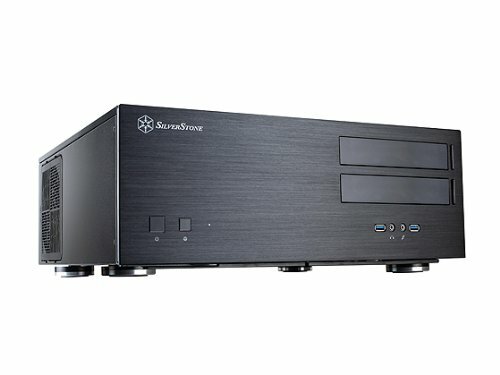 For those looking to build a powerful home media sever with security features, this is the perfect case.